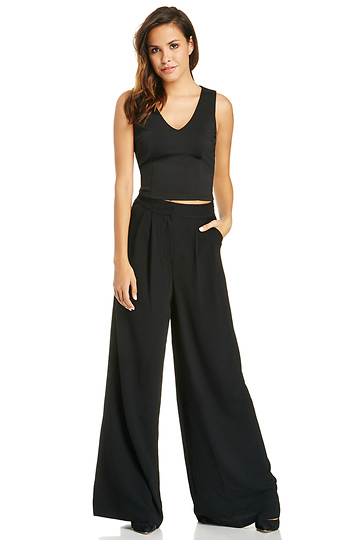 Get lost in the glam that is our Classic Wide Leg Pants featuring a hidden zip and double hook and eye closure, pleated waist, two pockets, and faux back pockets. Stylist Tip: Style with our Turnlock Strap Handbag. Length: 46 in. Waist: 27 in. Rise: 15.5 in. Inseam: 31.5 in. Leg opening: 31. 5 in. So I was expecting the worst from these pants. For one, I'm 5'10" and none of the other pants I've ordered from DL have fit me, or I felt the fabric/wear of the pants was too cheap. I was absolutely blown away by these pants though! I purchased a medium in the black and tried them on as a high waist pant. I HAD to put on 3 inch heels, otherwise they were dragging on the ground. They're very long. The fabric is textured so that's odd, but it's very comfortable and not sheer at all. I love how these pants fit, the length, the fabric, and overall how they make my outfit look. Very beautiful pair of pants and the quality is great! However, these are very, very long. I'm 5'7 and put on 5 inch heels and these were still on the floor. Definitely do not recommend for shorter ladies. These pants are gorgeous! They fit perfectly high on the waist and are cut beautifully. The material is not thick but not thick either. Just like the other reviewers, the length was much too long. Im 5'7 and even with my heels, I would never be able to walk freely without thinking I may trip. You will definitely need to hem them. Im looking forward to wearing them. These pants are great. I am 5'9 or so and I wear a 34-35 inch inseam. I wore them high on my waist and they still dragged the floor. I was scared to purchase them at first. They are quite classy. They can easily go from day to night.